The Policy Lab was created to bring experimental thinking into the UK Government. This has included using design techniques to think about the future, such as in our recent project with the Department for Transport on maritime autonomy. We have tested ethnographic techniques, helping the Department of Work and Pensions understand claimants’ perceptions and experiences of interacting with Jobcentres. And we have combined data science with design thinking to create new ways of doing policy-making. My Policy Lab research question, based on my recent Masters in Art and Science at Central Saint Martins College, is whether there is a role for art in policy-making. Policy-making is considered by some to be an entirely objective and technocratic pursuit. As far back as the 1820s, the French philosopher Henri de Saint-Simon proposed a new political order based on scientific reason: “the correct decisions can only be the result of scientific demonstrations, absolutely independent of all human will” (cited in this Institute for Government publication). Saint-Simon’s political order has, to date, not materialised. More recently, Minouche Shafik, former Deputy Governor at the Bank of England, debated at the Oxford Union whether we are in a ‘post-truth’ era. Some would argue that the emotional, instinctive and irrational have always played a part in decision-making. Artists could be considered ‘experts’ at probing our emotions. Many people will recollect a deep and emotional experience when faced with an artwork, whether a painting, film or performance. 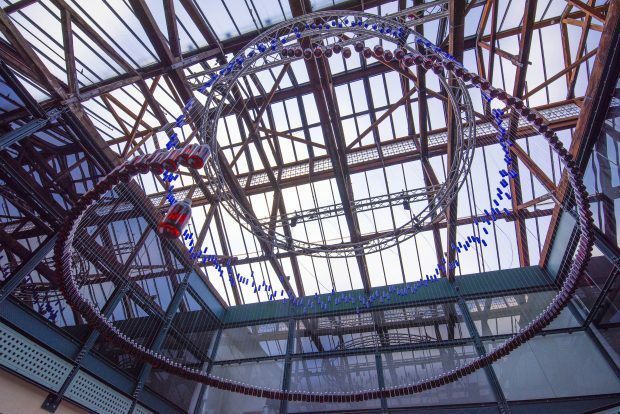 Eliasson produced the visceral Ice Watch in 2015 to support the UN climate change negotiations. 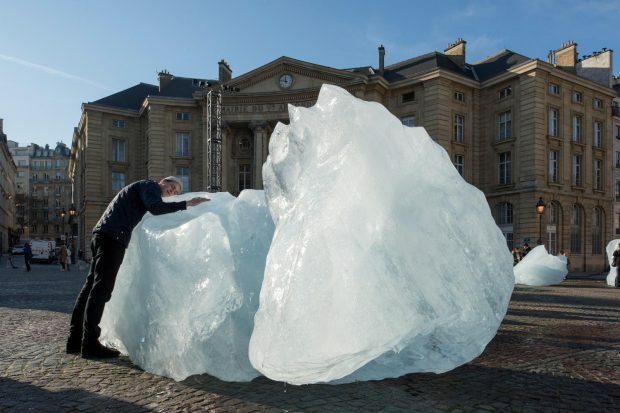 Twelve blocks of ice were towed from the Arctic and left to melt in the streets of Paris. People touched the ice, heard it trickling away – a profoundly moving experience in a city where policy-makers were taking decisions that would shape our collective futures. 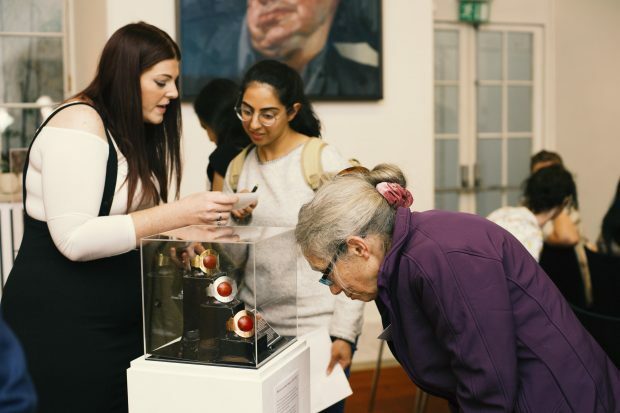 Through my work at Central Saint Martins, along with discussions with knowledgeable colleagues at the Government Art Collection and the Royal Society, I propose three ways that art can play a role in policy-making. Data is increasingly pervasive in our lives. This creates tremendous opportunities for government to apply data to create better public services – ones that can be more tailored to the citizen, at lower cost. Yet processing, analysing and presenting data is “increasingly removed from the everyday experience”. As data grows in its vastness, complexity and penetration, it is also becomes more alienating – in my view this is one driver behind the ‘post-truth’ trend described by Shafik. Outside my day job I recently collaborated with the data artist Cath Sleeman to create an interactive data visualisation for Nesta’s recent FutureFest. 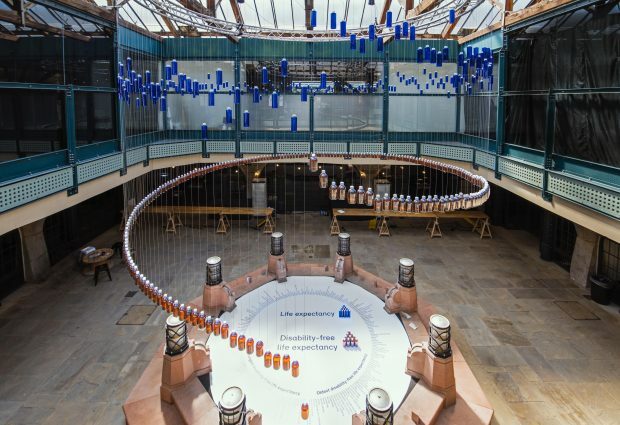 The artwork showed a particularly technical yet important piece of data – “disability free life expectancy” (DFLE) – the average years we can expect to live without a life-limiting health condition or illness. It shows there is over a 20-year gap between the places with the highest and lowest numbers in the UK. For example, dwellers of Richmond Upon Thames can expect 71 years of life without a life-limiting condition or illness on average; for citizens in Blaenau Gwent, South Wales, that number falls to 50 years, on average. My main lesson from this experiment has been that sharing a powerful presentation of data with a broad audience results in creative policy suggestions. 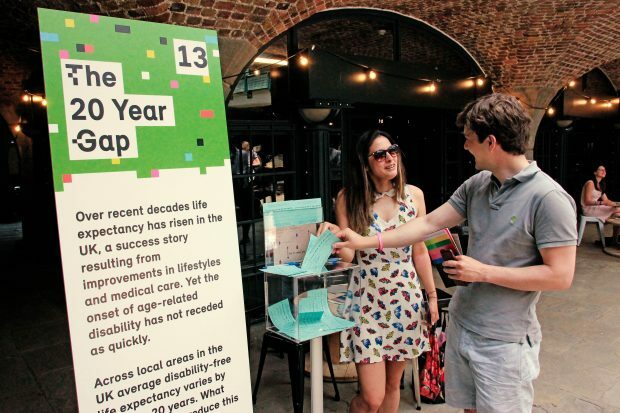 The ideas for ‘how to close the 20 year gap’ suggested by FutureFest participants, for example, ranged from early years education, to controlling sugar, to radical approaches to rebalancing the economy. Policy decisions made today have long lifespans, whether in energy generation, flood infrastructure or industrial strategy. The Government Office for Science has long recognised that thinking about the future helps minimise the risk of public policy being rendered obsolete by changes in technology, geopolitics or society. However, for lots of reasons, thinking about the future is difficult – we are understandably preoccupied with present-day events, problems and opportunities. How can we use artistic approaches to create a richer conversation about the future? Recently the Royal Society struggled with this very challenge. The Society is one of the world’s most historic science institutions. In 2016 they started considering how future research will be influenced by the culture in which tomorrow’s scientists operate. This includes pay, funding, information sharing, attitudes to risk, lab etiquette – the unspoken rules and signs that can determine what kind of research is done, by whom, and for what purpose. The Society found it difficult to elicit from today’s researchers what a positive or negative future research culture may look like. 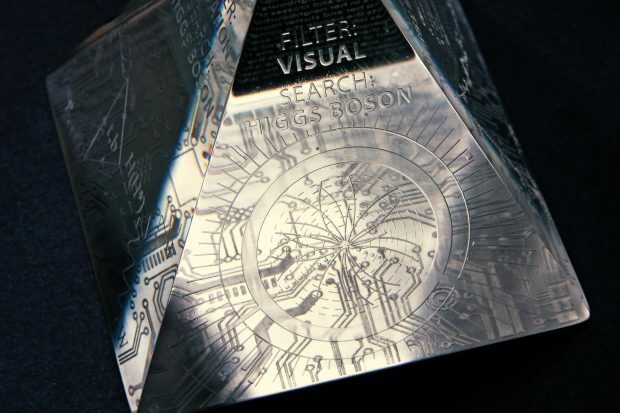 To overcome this, Central Saint Martins art students suggested creating speculative artefacts from a futuristic Museum of Extraordinary Objects, 2035 – to ask questions about the research culture that had created them. The ‘Museum’ included a Lab Cab to enable the transportation of live tissue from hospitals to hackspaces and home laboratories. There was also a Youngs Translator to decipher between scientific disciplines and the Public Ballot for allocating civic funds towards research projects. These provocations were designed to stimulate thinking about the way research is currently conducted and suggest alternatives such as the possible role of citizen scientists; the future of open access research; and approaches for engaging the public in research. My main lesson from this work is that the physical artefacts succeeded by making abstract concepts more concrete and materialising them. Rarely did researchers or stakeholders like the artefact – but they opened a conversation about the future: “if this represents a negative future, then what is a positive?” “What needs to happen in the next 10 years for this artefact to be created?” The Society has incorporated the ideas developed through these discussions in their Research culture publication and is beginning to roll out initiatives based on the work. This includes, for example, the ‘Model CV template’, a recruitment tool to recognise the broader set of activities researchers undertake. My third area is about applying creativity to policy-making. Many policy officials will recognise the creative block experienced when a senior manager or minister requests new ideas to “move us away from conventional thinking”. The feeling of terror when faced with an empty page of A4, wondering where to start! Artists – literally – start with a blank canvas. They deploy a range of techniques to move beyond this intimidating void to beautiful, insightful, structured and dynamic contributions. The collage artist, Rod Judkins has translated his experiences into a series of practical steps to improve creative thinking in any context or workplace. Similarly, students at Central Saint Martins have imposed artificial restrictions on their practice to generate fresh artistic ideas, and this approach has already been adapted to assist University of the Arts London education professionals. Policy Lab has recently experimented with borrowing from the arts to help a policy team overcome a block in their work. The Lab worked with the UK Space Agency to help Government map the dependencies between critical assets and space services such as GPS and satellite communications. Some of the dependencies are obvious, such as that between ships and GPS. However, in other areas, the picture is less clear. We overcame this block by borrowing from a participatory arts-led approach which I had previously used at the Tate Modern to help gallery visitors collectively construct a data map of climate change in the Indus Valley. 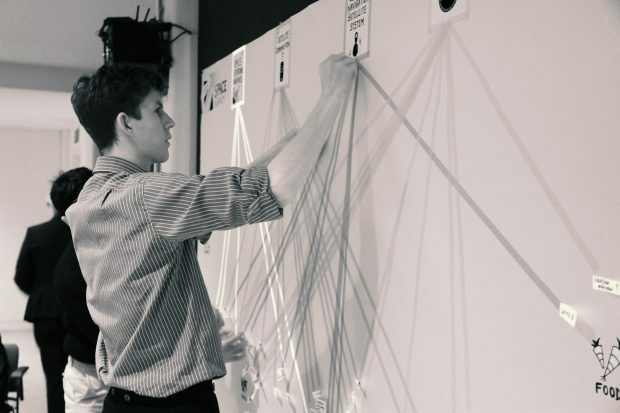 The Policy Lab organised a collaborative workshop to build a map of the dependencies between different types of UK critical national infrastructure and UK space services. My main takeaway is that this participatory arts-informed approach achieved two important policy outcomes. First, Departmental representatives could watch and learn from each other as they visibly added to the map – this was especially useful when some Departments were at relatively early stages thinking, whilst others, such as transport, were already experts. Second it allowed the group as a whole to see how certain space services were critical for a whole range of public services – and in one snapshot, how vulnerable we are to loss of satellites. These practical experiments and projects have been a useful way of testing ideas and developing the research question. My interest in the role of art in policy-making continues through current and emergent Policy Lab projects, and I am keen to share experiences with others. Do you think art has a role to play in policy-making? Are there any ways or examples I’ve missed? Or should art be kept independent from politics? Please tweet @PolicyLabUK or email policylab@cabinetoffice.gov.uk with your thoughts.